Weeride are well known for their range of excellent bike seats, but they also produce award winning balance bikes that are well worth considering when you are looking for the best balance bike. Weeride balance bikes are available for all children aged between 18 months and 6 years, with the range containing just two options which are the Weeride First Balance Bike and the Weeride Deluxe Balance Bike. 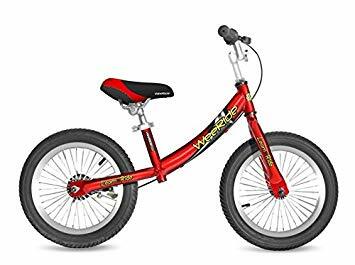 The Weeride First Balance Bike will be a great introduction to cycling for the very youngest children, with a stylish metal frame that comes in a choice of red or green. One of the defining features of the Weeride First Balance bike is the easy step through frame which makes the bike manageable for young riders, and the seat is adjustable from 31 - 42cm which means that the saddle height can be changed as your child grows. This makes it comparable to the Puky LRM Learner Bike which has a similar feature (but is usually more expensive at around £70). The bike has been recently improved with a soft saddle that makes for a comfortable ride and also comes with a carry handle for parents. This comes in handy when your child has had enough of riding and you end up carrying the bike! The Weeride First balance bike now includes pneumatic air tyres with an angled valve, a rear band brake for extra safety and safe non slip hand grips. These features make this bike an excellent choice for 2 year olds and is featured in our guide to the best balance bikes for 2 year olds. 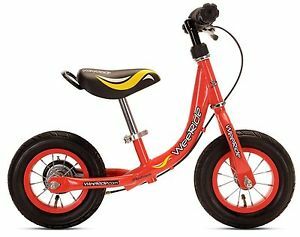 It is marketed as being suitable for those from 18 months, but we think that toddlers of this age might struggle with this bike and there are more suitable options available. If you are shopping for a slightly older child or need a bike larger than the Weeride First Balance bike, then your next option from Weeride is the Weeride Deluxe Balance Bike. This is a much larger bike that is designed for older children that are not ready to ride a pedal bike yet, and it is a quality bike with a 14 inch frame, a beautiful Weeride paint finish and a stylish two tone seat. The 14 inch wheels make this a great choice for older children as many other models use bikes with a 12 inch frame. The seat height ranges from 45cm – 52cm, so this bike might even be too old for 3 year olds and we think it would be most suitable for the 4-6 year age range. Check out our other recommendations in our guide to the best balance bikes for 4 year olds. The Weeride Deluxe Balance bike also features proper air tyres which provide a comfortable ride, a rear hand brake and safe non slip hand grips. Available for around £100, this is not a budget option but the quality finish in silver or red from Weeride means this will be one of the best looking bikes in the playground.